The 9th. Annual Moonlight Pond Tour is coming soon and you don’t want to miss this Wonderful Night! This is the original and only Garden Tour of it’s type in the state of Tennessee! This Water Garden Tour was founded and is hosted each year by Carters Nursery, Pond & Patio of Jackson, Tn. (Madison County). The Moonlight Pond Tour takes place each Fall and coincides with the Full Moon. The Moonlight Pond Tour will showcase Eco-System Ponds, Water Gardens, Pondless Waterfalls, Disappearing Fountains and Koi Ponds, all under a Gorgeous ‘Moonlit sky’ and is enhanced by AWESOME Landscape Lighting. “People just Love this event” says Mark Carter, Designer at Carters Nursery. “It’s Very unique! Most people have never been on a Garden Tour at night. But once they see the Landscape Lighting and the Waterfalls glowing and the fish sparkling in the Underwater Lights, they are Mesmerized. It’s a great night out with the family or friends and a Wonderful Date Night” says Carter. Now in its 9th year, The Moonlight Pond Tour features favorite Ponds from years past along with some awesome new Water Features to enjoy! This is a self guided tour and is easy to follow, so tour at your own pace! Most of the stops are close together and the signs and map booklets are wonderfully easy to follow. When: Saturday, September 21st. from dusk till 11pm. Come join us for a ‘Evening by the Pond”. We have a FUN event coming up next Thursday evening that I hope you can make it out too! We call these events – ‘Evening By The Pond’ and they are a great venue for pond lovers to socialize together, talk about their plants and fish and enjoy each others little piece of PARADISE. Rickey & Vandy’s Party Barn & Tiki Bar are AWESOME! Come out for a Great “Evening by the Pond”! Thursday, August 15th @ 6:30 pm Ricky and Vandy Williams are sharing their piece of paradise with YOU. Ricky and Vandy will be grilling and making their ‘Homemade’ Ice Cream. 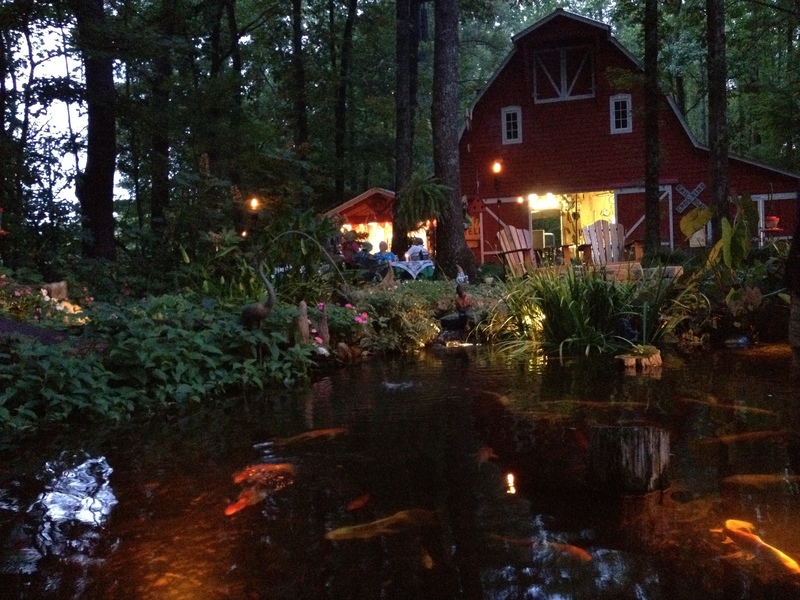 Enjoy the treats from the Party Barn beside their breath taking Pond! It’s going to be an enjoyable night! Mark Carter will be there to have an educational discussion on the lighter side about water features. If you have a water feature and want to talk a little shop, or would like to see what one is all about, this is a great chance to find out. Bring a friend or two and come on out! Give me a call at the Nursery #424-2206 to let me know your coming and I will give you the address. See ya there!